Christians have tended towards one of two extremes as it relates to psychiatric diagnoses and medications. Some, on the one hand, tend toward a full embrace; believing that diagnoses and medications perfectly describe and treat all our common problems. Others, tend towards the extreme of complete distrust, believing that diagnoses and medications are always wrong and even sinful. Michael Emlet desires to help readers, and especially counselors, navigate these issues with more balance. As such, he has provided counselors with one of the most helpful resources for one of the most complex issues. 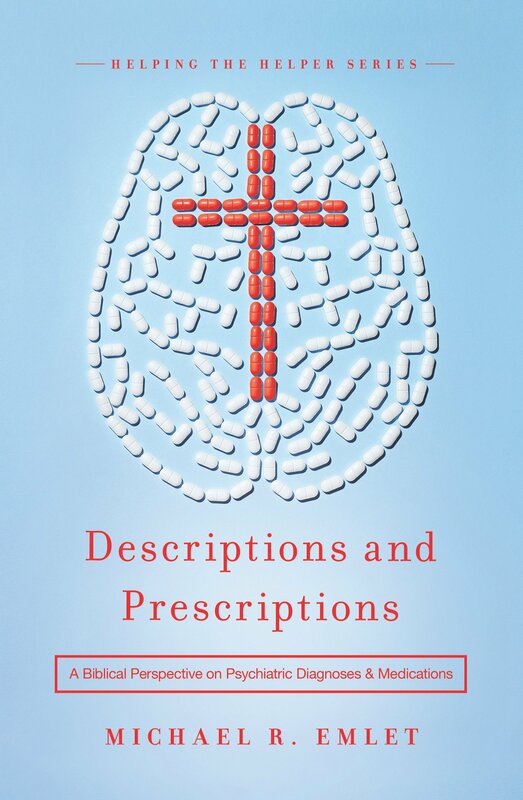 In many ways, Descriptions and Prescriptions is reflective of a new age in Biblical Counseling. Early on within the movement there was some reluctance to talk about the benefits of psychiatric care. There were those who, not always in leaders, were dogmatically opposed to anything that carried the scent of psychiatry and psychology. In more recent years, however, a more nuanced approach to the questions of mental health has developed within the movement. This is good. There is much common grace that Biblical Counselors can benefit from among those outside our movement. Emlet demonstrates this well. As both a medical doctor and a Biblical Counselor he can speak with authority and experience on these issues. Readers would be hard pressed to find a more credible voice on this issue. The book’s primary goal is to assess the benefits and limitations of psychiatric diagnoses and medications. Emlet breaks these two concepts down into different parts of the book, attempting to give concise but substantive introductions and explorations of each. So, part one gives ten chapters on “Understanding Psychiatric Diagnoses.” Here, Emlet gives a brief survey of the history of psychiatric diagnoses, an explanation of how diagnoses are made, and an exploration of both the common pitfalls and benefits of diagnoses. In part two, the good doctor presents nine chapters on “understanding psychoactive medications.” He walks readers through the “classes” of psychoactive drugs, the theory of chemical imbalance, and, again, the benefits and limitations of such drugs. In the final three chapters he pulls all of this information together to present readers with a “wisdom framework” for thinking about diagnoses and medications. The overarching benefit of the book is its brevity and depth. A work of this nature must cover quite a lot of material. To adequately make his case, Emlet must demonstrate a familiarity with the significant literature, the major issues at play, and the common criticisms of his view. He does this succinctly and yet substantively. His footnotes present a wealth of resources to consult for further support of his views, and the chapters themselves cover a wide array of materials. The book addresses matters of history, diagnostics, pharmacology, neuroanatomy, and spirituality. Emlet does all of this with great mastery, accessibility, and astounding brevity. At less than 100 pages, the work is a substantive critique of both extremes views. This is a rare work and ought to be required reading for every Biblical Counselor! It is of such profound importance and insight that I can only imagine it will make a lasting impact on the Biblical Counseling movement. I cannot recommend Descriptions and Prescriptions enough.